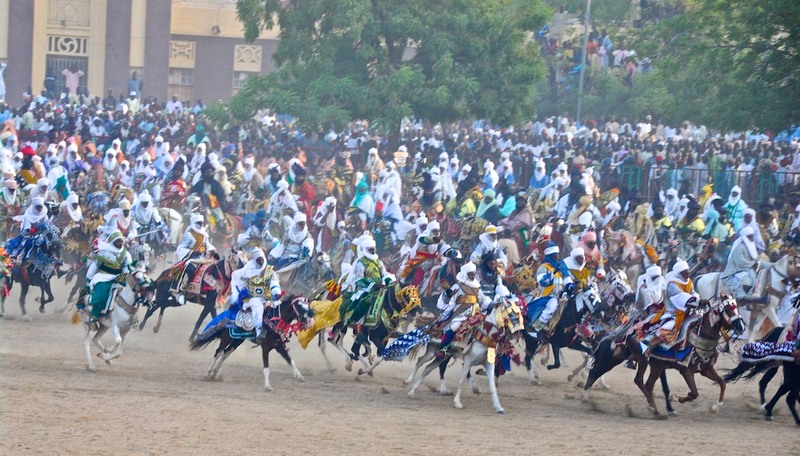 Roaring muskets flash salutes as thousands of warrior horsemen race onto a dusty parade ground in front of the Emir’s palace marking the start the annual Durbar festivals in Northwestern Nigeria. Horseman clad in colorful robes, indigo turbans, ostrich feathers and glistening swords honor their Emir who enters the parade shielded from the sun by a massive twirling parasol. It is the season for the Durbar! 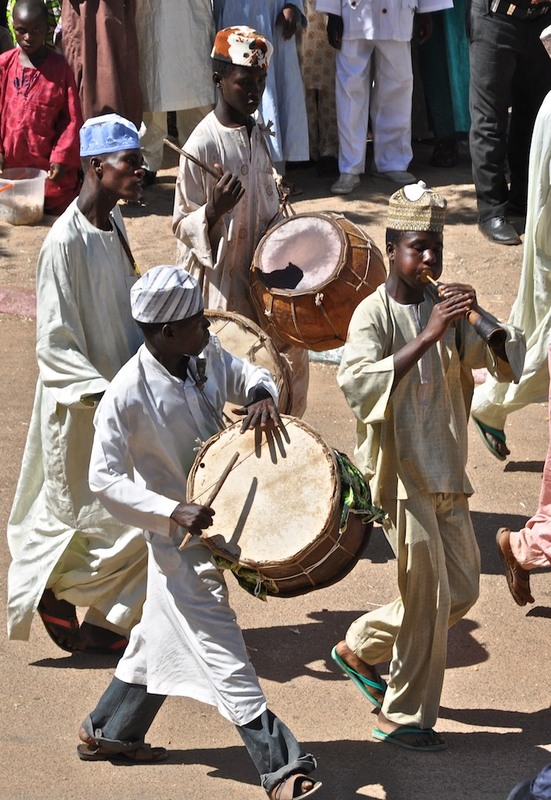 In the northern reaches of Nigeria lies two cities, Kano and Katsina, both famous for Durbar festivals. 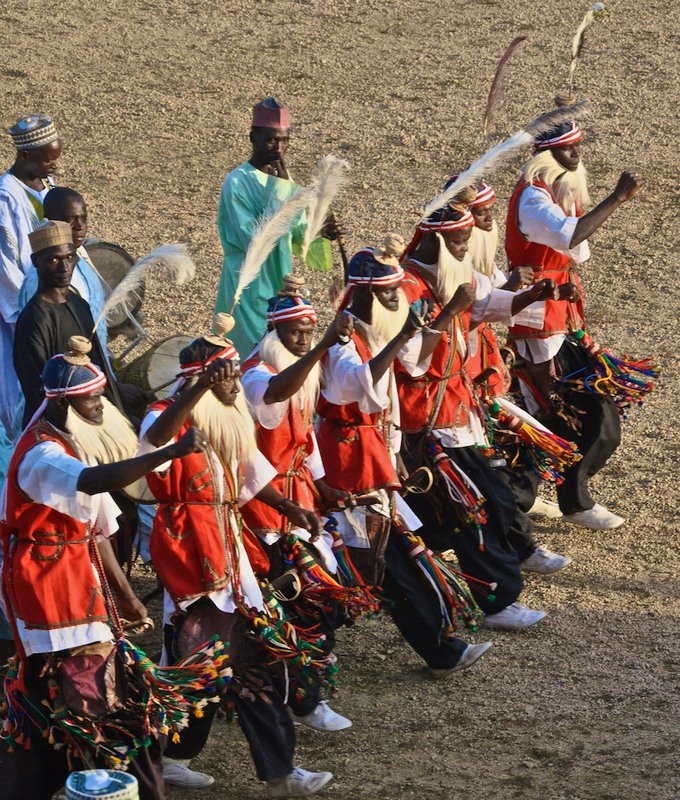 Kano is the oldest city in West Africa settled over 1000 years ago by the Hausa people. Today, it is the second largest city in Nigeria. 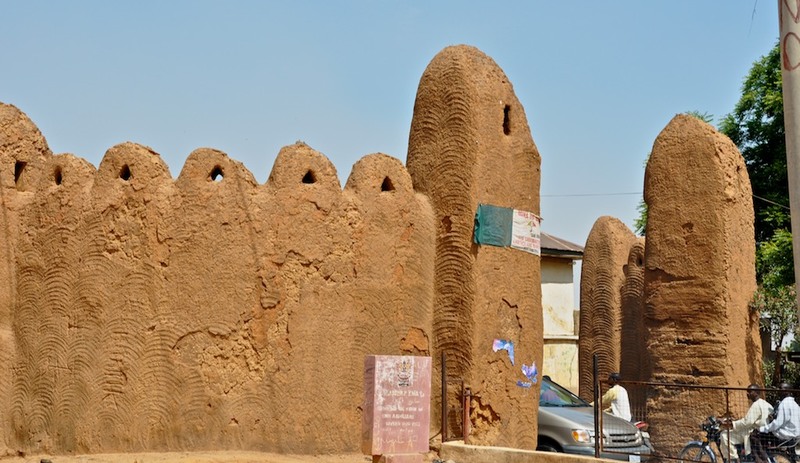 The old city of Kano is surrounded by a massive 11th century mud-brick wall that extends 17.7 kilometers. The wall still stands and must be navigated by a series of sixteen gates. Not to be outdone, Katsina is surrounded by 21 kilometers of a mud-brick wall and is Nigeria’s northernmost city. Both cities are predominantly Muslim, comprised mainly from Fulani and Hausa ethnic groups. Often we think that goods and ideas travelled one-way into Africa and overlook the fact that the ancient trade routes were a two-way street. Camel caravans carried luxurious and rare commodities in both directions along the trans-Saharan trade route creating a thirst for highly prizes items and curiosity for new beliefs. Out of Africa, went indigo, gold, ivory, kola nuts, cowry shells, salt, and ostrich feathers. From Timbuktu, Katsina and Kano were the crossroads of trade with flourishing markets. Arab traders brought Islam. The Hausa and Fulani groups converted to Islam in the eleventh century and remained under Hausa leadership until 1804 when the area was engulfed in bloody wars and fell to the conquering Fulani armies under the Islamic reformist, Usman Dan Fodio. The Emir of Katsina, Alhaji Abdulmumini Kabir Usman, enters the parade ground under a huge parasol, surrounded by a splendid entourage of indigo turbaned horsemen, guards bedecked with ostrich feathers, camels and servants in brightly-colored robes. Over millennia, a tribe or a nation, proudly displayed military might by organized parades. In Mamluk Egypt, ceremonial processions and parades showcased the military’s training and displayed their horsemanship and preparedness for war. “Mamluks reminded the whole population of Mamluk utility and ferocity by continually training in military skills, publicly practicing horsemanship (polo), and parading in disciplined regiments behind the sultan, who was shielded by a gold-embroidered yellow umbrella…” (Urbain Vermeulen, D. De Smet, J. van Steenbergen. Egypt and Syria in the Fatimid, Ayyubid, and Mamluk Eras.). 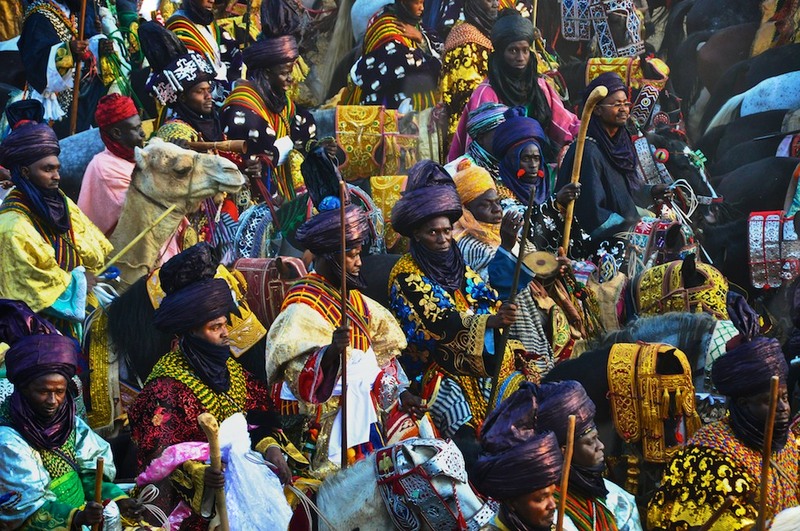 Cultural, religious and military traditions moved into Northern Nigeria along the trans-Saharan trade route. Late Emir of Kano , Alhaji Ado Bayero and entourage of guards and servants. In the long history of a military parade, the origin of the word, durbar, comes from Urdu, darbār, (dar meaning door and bār meaning entry or audience.) 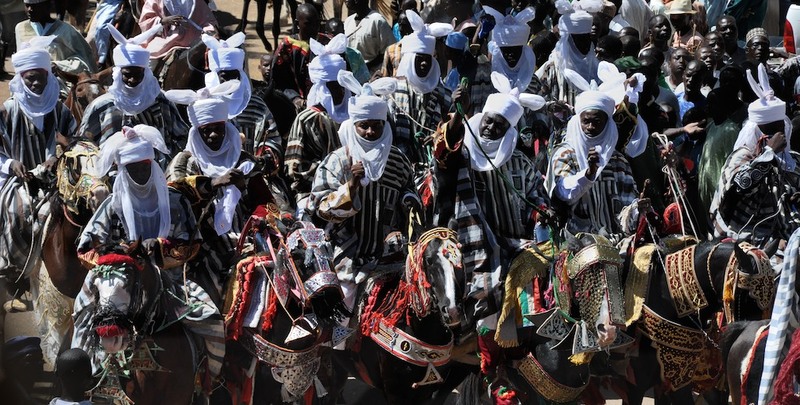 In Nigeria, the Durbar dates back 200 years when horses were used in warfare to protect the Emirate. Each noble household was expected to defend the Emirate by forming a regiment. 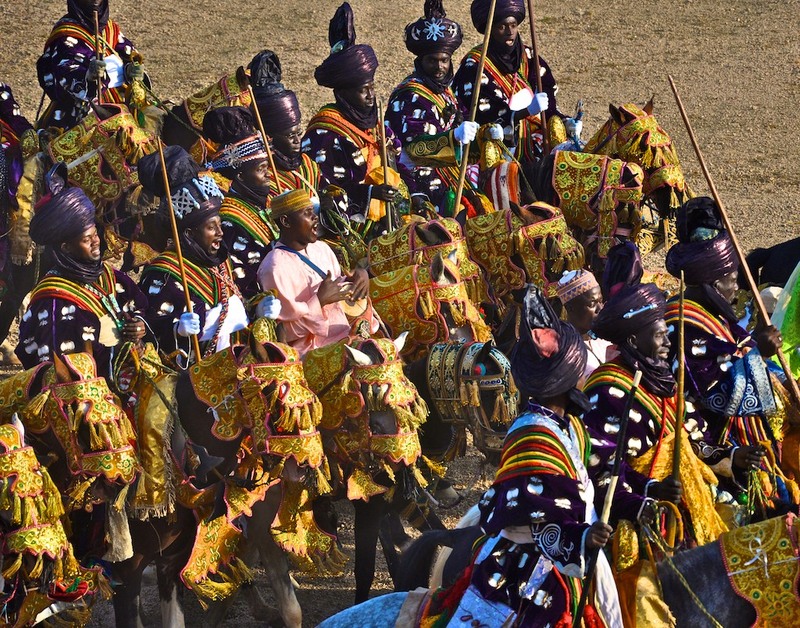 Once a year, the regiments would gather for a military parade to demonstrate allegiance to the Fulani ruler, by showcasing their horsemanship, readiness for war, and loyalty. The Durbar celebrates special occasions such as the Muslim festivals or Sallah (from the Arabic word, Salat, meaning prayer) to honor visiting Heads of State, government officials, and installation of new emirs. I am in Northern Nigeria, with the Nigerian Field Society and organizer Paulette Van Trier, to witness the Katsina and Kano Durbar Festivals. 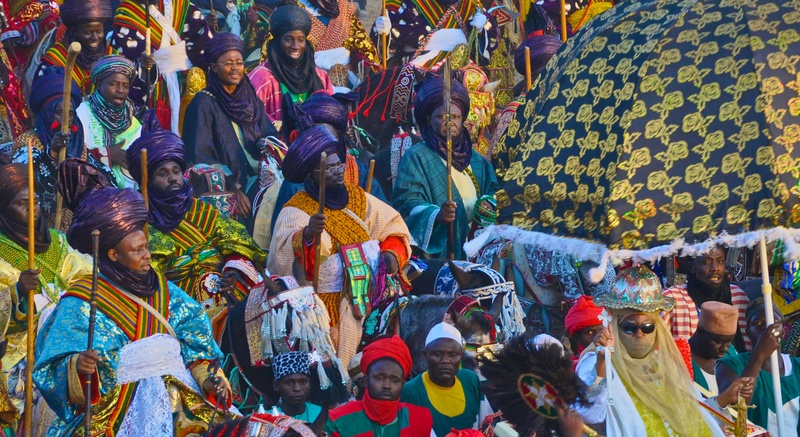 Tied to the lunar calendar, the Durbar is celebrated at the end of Ramadan, Eid el-Fitr, and at the start of the pilgrimage to Mecca, Eid el-Kabir. My journey begins as the Hausa guide explains his name, Danjuma, born on a Friday; his English name, Friday; his Muslim name, Essa. I marvel at three distinct identities that reflect the heterogeneous nature of Nigeria. We travel by bus to Katsina, 200 kilometers northwest of Kano. The bus enters the Palace gates and we climb stairs to the covered reviewing stands that overlooks a sandy parade field. People and food vendors begin to gather. The Nigerian National Anthem plays loudly and the crowds grows silent and still. On the last note, everyone jostles for first row position. The procession starts with groups of horses lead by noble households and district heads. Horse and riders circle the grounds counter clockwise, passing to pay respect to the dignitaries. “Ranka ya Dede”, the horsemen shout. The right arm bent at the elbow and raised with fist and thumb directed toward the sky, “May you live long”! Their greeting is in Hausa to honor both elders and royals. The Durbar is a ‘men-only’ event. Turbans with one ‘ear’ or two denote royal lineage. The procession is strictly men only dressed in magnificent turbans many with one ‘ear’ or two sticking out denoting their royal linage. Young and old participate to insure that tradition is observed through generations. All approach the viewing stands raising their fist and shout “Ranka ya Dede”, proudly proceeding to line the sides of the parade ground. Rhythms of the talking and traditional drums fill the air with the shrill of trumpeters and fluters. Acrobats flip and catch one another, musicians, warriors riding brightly armored horses make their way to assemble along the parade grounds. 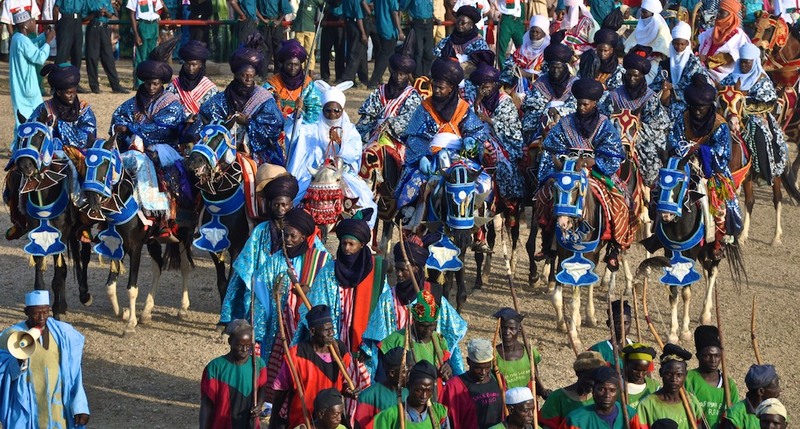 When hundreds of horsemen are on the parade grounds, the Emir’s procession begins down the center, including his guards, his sons, riderless horses for his wives, and camels. Finally, the Emir himself rides among his guards and servants amidst the shooting of flintlock muskets. The Emir is immediately recognized, veiled and clad in white with a huge fanning parasol lifts up and down over him. After he pays respect to the governor, the horse regiments race up to the Emir at a gallop to demonstrate their courage, agility, and respect. The Emir gives an Eid el-Kabir address to the crowd’s approval. Before each group or noble household musician, dancers, acrobats and guards introduce the noblemen. Intense drumming, dancing and singing excite the audience who shout their approval. 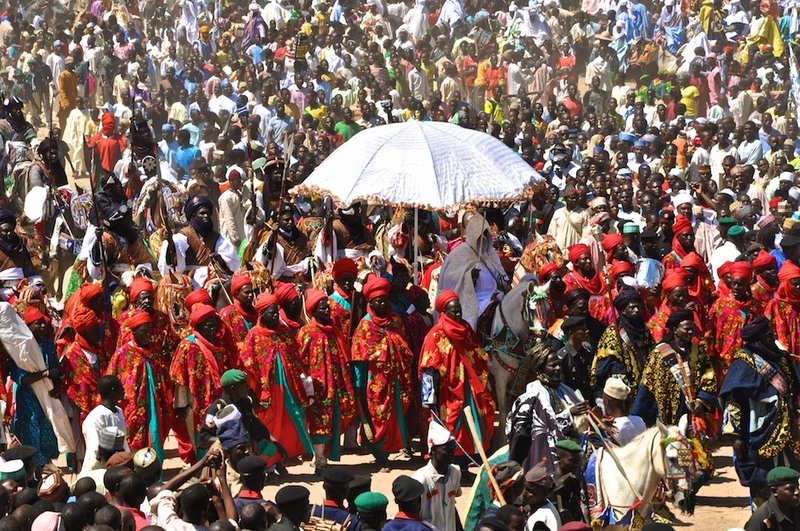 We travel back to Kano to attend the Kano Durbar the following day. Once again, the crowds press into the fences, people dangle from tree limbs and fences to watch the spectacle. Dust everywhere, we have front row seats. Anticipation! 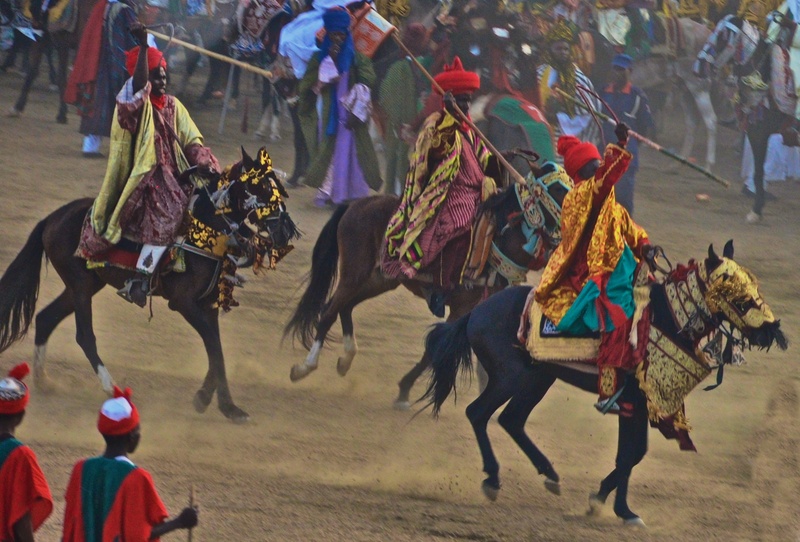 As in Katsina, the procession of horsemen, acrobats, and musicians parade in front of us in a myriad of different costumes of every conceivable color. Indigo turbans shine metallic and swords glisten in the sun. After nearly 2000 men and their horses file past, the arrival of the Emir is announced by ancient musket fire from the Emir’s guards. The procession is lead by his family, wives vacant horses, bodyguards, servants and the Emir himself receiving an outpouring of favorable shouts from the crowd. Finally, horsemen brandish their swords and charge at full gallop to stop only feet away from the Emir. The crowds cheer and rush onto the parade grounds. In the fading afternoon light, this year’s Durbar is over but the ancient traditions remain, for now. I am honored for your comment and that the article brought you good memories. You must have wonderful stories of that time. Have you written anything or have old photographs? Thank you so much for your interest. Please share some pictures and memories of that time with us. I personally would love to see some scenes from the old time. As a Nigerian, I cherish cultures of the different ethnic groups and always interested in reading and knowing more about them. Lesley thanks for this post. I stumbled upon your site just now. This reminded me Baban Sallah was yesterday. In Kano, our ex Central Bank Governor is the new Emir. Hopefully, better things to come? Thank you Ayo for your comment. I know you have a great background knowledge about Kano so your comments are much appreciated. L.
Thank you for your interest in my photograph. I am honored to have my photo used for a table top calendar. I will send you an email now. Hi, thank you for connecting my blog to your blog. You seem to enjoy Lagos. I wish you well. I enjoyed it Pls can i use some of ur text in my long essay project? This article, though a mere Keyhole’s view of the colorful Muslim tradition in northern Nigeria, is very impressive and very informative and educative to an especially interested non native. I wish this article would some day, in the near future, be expanded further to give it a wider view to capture more details of these ceremonies and festivities of the Fulani emirates, now for convenience, dubbed as Durbar – originally an Urdu word, clearly unrelated to Fulfulde or Hausa culture. Certainly this article, might be a mere keyhole’s view of the colorful Muslim tradition in northern Nigeria, but is surely very impressive and very informative and educative to an especially interested non native. In my library, I have only one academic book dedicated to the Durbar. Much work needs to be done to gather traditions and heritage throughout a vast land of Northern Nigeria. 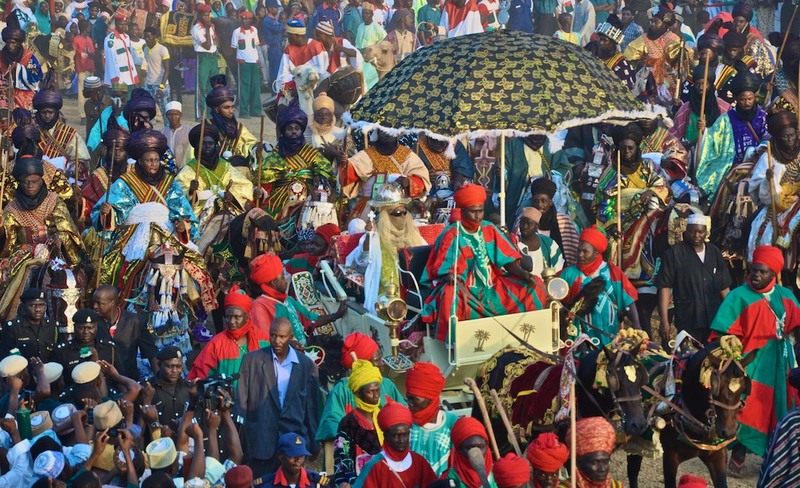 You might like to know that Durbar- Nigerian Style is the most popular article on my blog with at least 10 people reading it a day from all over the world. Fascinating commentary and wonderful photos! What an amazing experience! Thank you, Henry! I always appreciate your view of the world. L.
Thanks for this. I plan to attend one of the Durbars this year, I was at the Zaria Durbar in 2017. I think about Kano this time around. Cheers. You are most welcome. I hope you enjoy the Durbar in Kano! L.